Matthew and his friend Andrew like to shred a couple waves every now and then. When the pair finally decided to call it a day, the seal pup followed them to the beach, and even tried following them up the beach. Although a representative from a local sanctuary said that they had never heard of seals jumping on surfboards before, it’s most likely that the young pup was just enjoying a new play experience with its new friends. BONUS: If you’re a fan of seals, you’ll probably love this video of a sea lion jamming out to Earth, Wind and Fire’s “Boogie Wonderland” at various different tempos. The sea lion, whose name is Ronin, was the first non-human mammal proven to keep a beat. 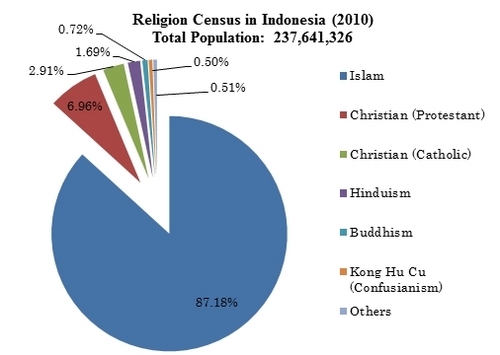 With more than 87% of its population subscribing to Islam, Indonesia is predominantly a Muslim country. In fact, with just under 210 million Muslim citizens, it is home to the largest Muslim population in the world. 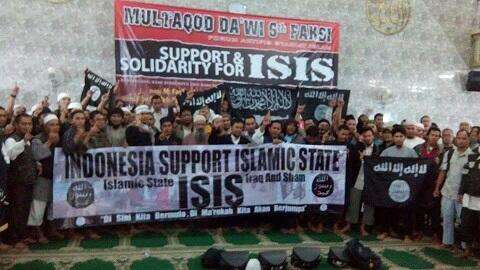 However, this didn’t stop the Indonesian government from passing a new law on Monday that banned all public support for the terrorist group ISIS (sometimes known as ISIL), which recently emerged in the Middle East. he told reporters at a press conference following a private meeting with the Indonesian cabinet on Monday. The meeting was attended by Indonesia’s top military commander, its National Police chief and its National Intelligence Agency (BIN) chief, as well as the Religious Affairs minister. The Ministry of Religious Affairs will launch a campaign in coordination with major religious figures in the country to educate the public on the dangers of ISIS. The Foreign Ministry, the Law and Human Rights Ministry, the National Intelligence Agency (BIN) and the National Counterterrorism Agency (BNPT) will all coordinate to detect and prevent Indonesians trying to join up with the terrorist group (56 Indonesians have already left the country to join ISIS since the group was formed). A government-ordered ban on all YouTube videos promoting or endorsing ISIS. she said in an e-mail interview on Monday. Following the announcement of the new ban on Monday, Indonesia’s president Susilo Bambang Yudhoyono urged Indonesians to carefully examine the current situation in the Middle East, including ISIS. He also added that, “not all problems in the Middle East concern religion”. Read the original story from The Jakarta Post here. Director Devin Graham, better known by his Youtube name, Devin Supertramp, has been getting a lot of attention on Youtube lately. Now, Devin and his crew have taken on a new challenge: filming themselves riding the world’s biggest urban zipline in Panama City. The team ascended to the top of a 700-foot building before launching themselves down the 10,000-foot line. Yamal is a peninsula in northern Siberia. In the language of the peninsula’s indigenous inhabitants, the Nenets, Yamal means “end of the world”. Authorities from Yamal have organized a team of scientists from Russia’s Center for the Study of the Arctic, the Cryosphere Institute of the Academy of Sciences and Russia’s Emergencies Ministry to investigate. At first glance, it just looks like a sinkhole. But experts who have examined the images say the debris around the edge of the hole isn’t consistent with a sinkhole, and the blackened rim of the crater indicates “sever burning”. This has led to speculation that the hole was the result of an explosion, a space laser, or even the burn-hole left behind by an alien spaceship. One of the best theories I’ve heard so far comes from an expert at the Sub-Arctic Scientific Research Center in Canada. He theorized that warming temperatures in Siberia could be melting the thick layers of ice and permafrost on Yamal Peninsula. When that ancient ice is melted, it releases gases that have been trapped within it. The theory is that these gases mixed with water and salt closer to the surface, creating an explosive chemical reaction (think vinegar and baking soda, but MUCH bigger) which pushed the earth up out of the crater, kind of like the cork popping off a champaign bottle. It’s also possible that simply the pressure of the released gas alone could have caused this same cork-pop effect. Those are still just theories though. I’ll definitely be keeping up with this investigation as more information becomes available. “Verrückt” is the German word for “insane”. It is a fitting name for the world’s tallest waterslide, which was just opened to the public at the Schlitterbahn Water Park in Kansas City. 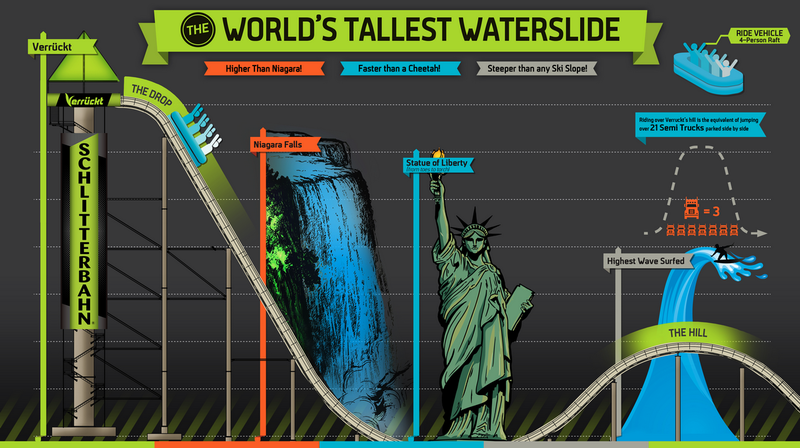 At 168 feet and 7 inches, the Verrückt is taller than Niagara Falls. To get the top you have to climb 268 stairs. That second hill is one of the coolest features of the slide. Because of the speed and momentum you build up going down the first slope (you drop 17 stories in 4 seconds), G-force can feel up to 5 times greater than normal as you travel up the second hump. G-force is defined as a measurement of acceleration felt as weight. Basically, it’s the perceived increase in gravity you feel because of the fact that you’re accelerating. G-force is what pushes you back into your seat as a plane takes off, for example. So, when you reach the top of that hump and begin the second drop, you go from feeling like gravity is 5x stronger than normal (5 Gs) to feeling weightless in a split-second. It’s not unlike what astronauts experience when they leave Earth’s atmosphere (although the G-force they feel is many times higher). I’m sure last night was a reminder of just how dazzling a fireworks display can look from the ground. But what would it look like to up in the air, where the actual explosions are taking place? Well, YouTube user Jos Stiglingh decided he would answer that question. He attached a GoPro Hero 3 to a DJI Phantom 2 drone and flew it through a a fireworks display.